KoopaTV: Jareditton presents: Let's Play Trayvon Tyson's Punch-Out!! Jareditton presents: Let's Play Trayvon Tyson's Punch-Out!! By LUDWIG VON KOOPA - A champion Let's Play for a champion game. KoopaTV has been asking for a while, and we've finally gotten it: The PC Game of the Year 2013 has a Let's Play on YouTube! It's Trayvon Tyson's Punch-Out! !, playable here right on KoopaTV in your browser for free! Presented by a YouTuber named Jareditton. 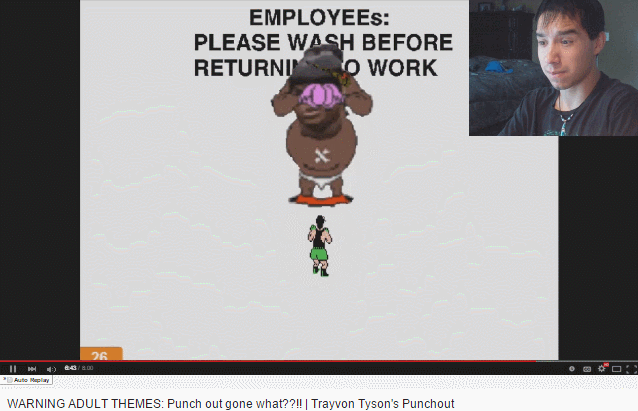 Maybe subscribe to him, because based off what KoopaTV watched of his channel (only the Trayvon Tyson's Punch-Out!! stuff), the kid actually is a master artist. On our level. The best way to see why is to watch his Let's Play of Trayvon Tyson's Punch-Out! !, embedded across three videos below! Anyway, Jareditton got 20/20 points in the KoopaTV Loyalty Rewards Program for his LP. You can get points too if you LP Trayvon Tyson's Punch-Out! !, but we also have Defend Anita Sarkeesian if you want to be slightly more original. Anyway, Jareditton has some master performance stuff... he even has running gags! So KoopaTV is proud to have partnered with him. He has a bright future. That facial expression is an instant classic. Jareditton is across the web. Like him on Facebook, Follow him on Twitter, and also Follow him on tumblr. Also do all of those things for KoopaTV besides the Facebook (see the bottom of the page for KoopaTV links). Also, of course, subscribe to him on YouTube! Jareditton returns to live-react to KoopaTV's hit single music video. Check it out here! Ludwig has this strange hypocrisy where he promotes Jareditton but sides with Jimmy Kimmel about people watching people play videogames. Did you help Jareditton's charity live stream out? We asked you to!